Horse Sport Ireland are considering taking their case to CAS. THE PROTEST LODGED by Horse Sport Ireland after a bizarre incident during Cian O’Connor’s run at the European Championships yesterday has been rejected. The protest was put in after a steward ran across O’Connor and his horse Good Luck’s path during what looked set to be a clear round. Good Luck hit the next hurdle and Ireland were left narrowly out of the qualification spots for Rio 2016. Following an initial rejection of the protest from the Ground Jury in Aachen, Horse Sport Ireland were dealt a further blow when the Fédération Equestre Internationale (FEI)’s Appeal Committee upheld the ruling by the Ground Jury. The statement makes the point that O’Connor had the opportunity to stop mid-round and make his intent to protest known. They suggest that the fact he was able to go on and completed his round weakened the cause for complaint. The Appeal committee would not overrule the Ground Jury, but HSI maintain their displeasure with the outcome and CEO Damian McDonald suggested they may take the issue to the Court of Arbitration for Sport (CAS). “We will be examining all of our options provided for within the rules of the International Governing Body the Federation Equestre Internationale (FEI) including a potential appeal to the Court of Arbitration for Sport,” McDonald said this morning. 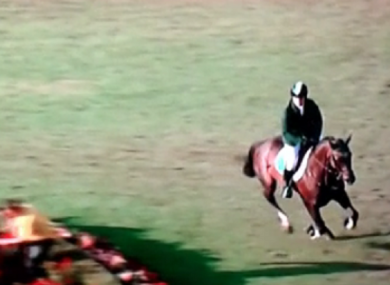 Email “Cian O'Connor pays the price for battling on after equestrian governing body reject appeal”. Feedback on “Cian O'Connor pays the price for battling on after equestrian governing body reject appeal”.